Other alternatives for low-pesticide produce are Farmers' Markets. They can also be a less expensive choice for organic food. Try not to go in blindly. Make sure you talk to the farmers at the market. Find out exactly where their food comes from by asking where the farm is located and how far it is from the market. If a farmer is selling food as organic, ask if he or she is certified. 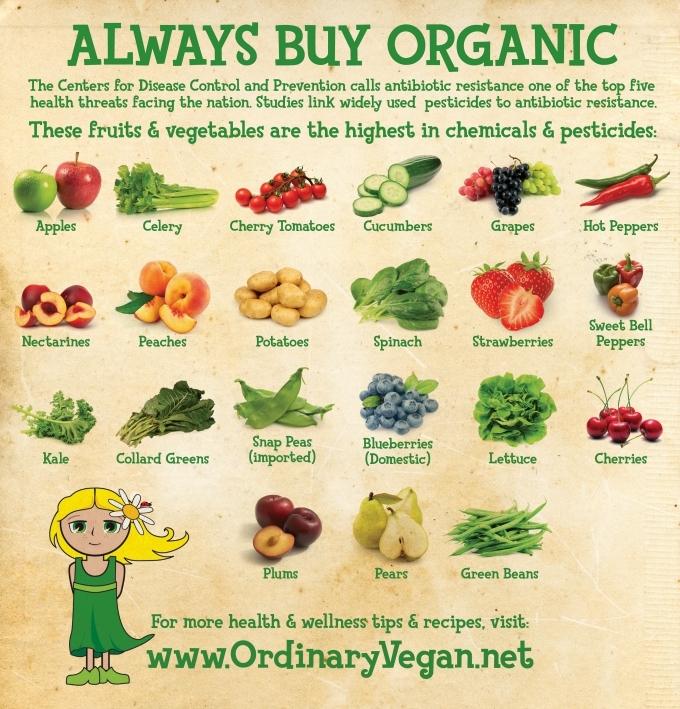 I also recommend buying local and in season for the least amount of pesticide use. Learn more about the local farms attending the market by going to your local Farmers' Market website. Here is a helpful link to finding organic farmers in the US sponsored by Local Harvests. It's really a shame that we live in an age that we have to constantly worry about our food safety, but knowledge is power. I hope these charts and lists help you make the best choices you can afford for your family. For more free health tips and delicious plant-based recipes, please sign up here. Wishing you a peaceful and compassionate week.